I am so happy that you have more independence. Your post really has made me think. We live in a three story house. All bedrooms are on the top level. All bathing facilities are on the top level. There is a small bath 1/2 bath on the main level. The laundry room is in the basement. If I were to have a stroke, I could not do the laundry at all. Since my fall, I have really wanted to move to a one level home. As we age, these stairs are just not a good thing. If illness hits, they are really not a good thing. 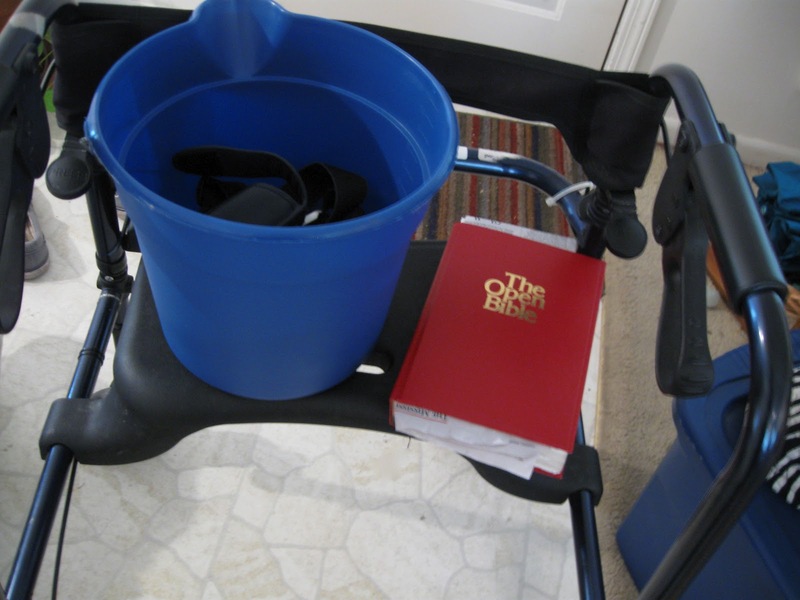 this is truly and amazing story today, i am so happy you are able to carry that bucket and move around without your chair. HOORAY from Florida. and you are so creative, great job on that. does this mean you are typing all this with one hand? yowsa on that. First me, then David. We keep our own walker stored in the laundry room. I am thinking about building a ramp at the front of the house. No point in waiting until we need it. Frustration is the mother of invention! Trying to do things, even if slowly and awkwardly is going to help on the way to full recovery much better than sitting back and wailing. It's great exercise! You're a smart cookie! I love it when something comes to fruition like that and makes life easier. Good thinking! Your creativity and determination are very impressive. You do continue to amaze. Thank you for the shout out and I thought of you when I posted since the flip fold can be done with one hand. Sure hope it works for you. Well aren't you just filled with helpful hints today?! 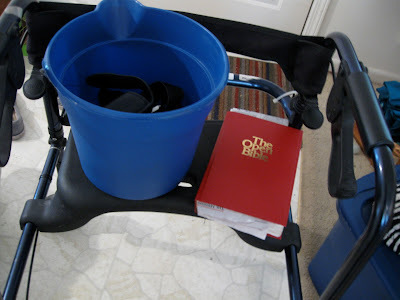 Who knew that a bucket could have so many extra uses, and that flip folder is awesome! Now why didn't I think of that clever invention??? You are so resourceful. I'm happy to find out that nothing seems to stop you. Keep it up. God is good and he is there for every step of your journey.